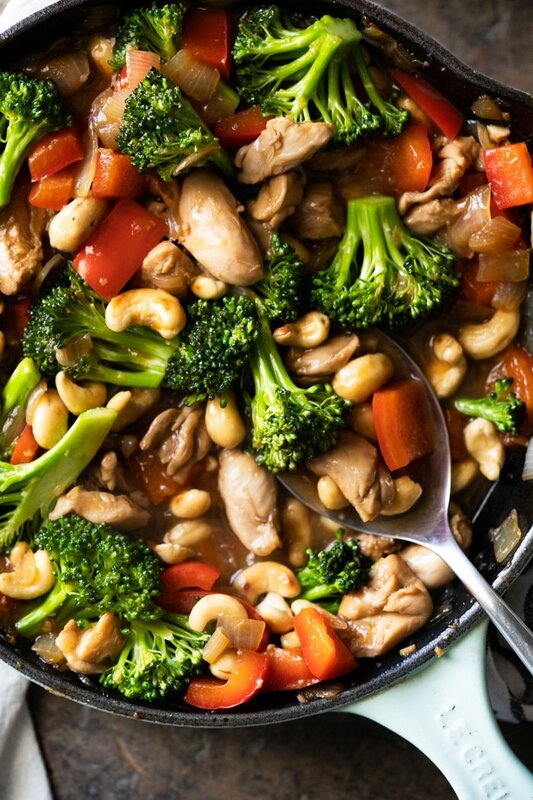 Surely better than takeout, this paleo and keto cashew chicken makes for one super scrumptious (and ultra speedy!) weeknight meal! Fresh, simple, and ultra saucy! 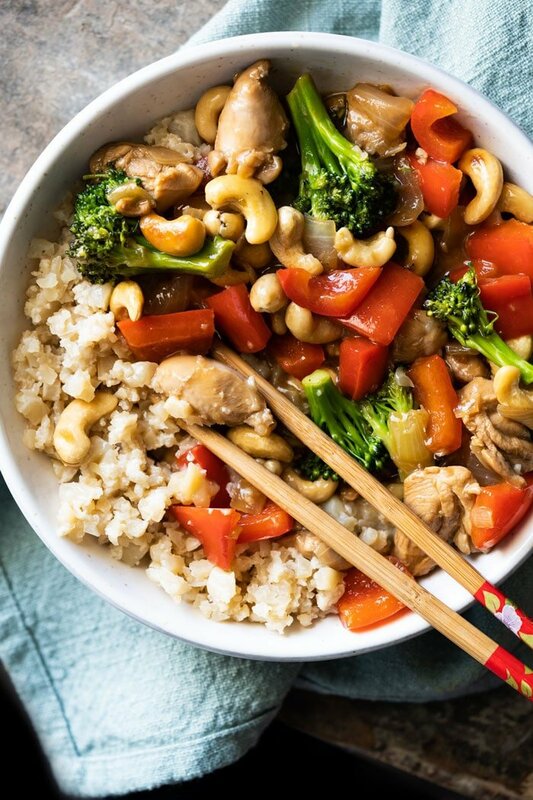 This cashew chicken is one of those low carb dishes that you’re bound to have on repeat throughout the week (week after week after week!). Its explosive flavors are totally addictive, and its just so (so!) easy to whip up. And talking flavors, I felt the need to take a few liberties with the ingredients. As many of you know, Chinese cuisine uses incredible sauces which are unfortunately not keto. But fear not, because with a few swaps here and there you still get super yummy results (if albeit, a little different!). 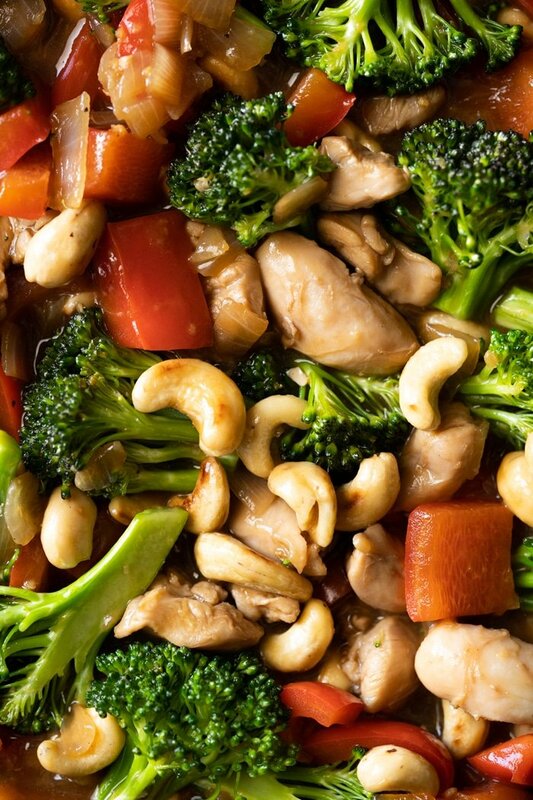 As mentioned, this isn’t your classic cashew chicken (i.e. with oyster sauce etc). Keep in mind that yumminess aside, these ingredients are high in sugar and have cornstarch and soy. So I took a different route and used some coconut aminos, fish sauce and a little ginger (i.e. I went a little Thai!). In place of the Chinese wine (Shaoxing), I just use a little chicken broth (think extra collagen and goodies! )… but do feel free to use some white wine instead! Also note that cashews are a little higher in carbs than other more keto-friendly nuts and legumes. So just be sure to adjust the amount to fit your macros, or you can even do some peanuts instead (ahem, peanut chicken!). If keto (and paleo or whole30! ), I cannot recommend enough that you serve it up with cauliflower rice. It’s wonderful this way, trust me! Just keep in mind that I prefer to rice my cauliflower slightly bigger here, so you get more of a ‘mouthful’ and it doesn’t completely blend into the cashew chicken. And if you’re looking for something a little extra special, whip up our coconut cauliflower rice from Keto Speedy Comfort Foods (it’s what I did here!). Looking for more keto Asian dishes?! Be sure to check out our famous pad Thai and coconut curry chicken! Mix all the ingredients for the sauce in a small bowl. See notes, but feel free to adjust the amount of ginger and sweetener to taste. Add 2-3 tablespoons of the sauce to the chicken, and allow to marinade for 10 minutes while you prep the veggies. Heat up the oil in a skillet or wok over medium high heat. Add the garlic and onion and cook for a couple minutes. Add in the chicken and cook for a couple more minutes. Add in the bell pepper, broccoli, sauce and stock. Make a slurry with the arrowroot and water (i.e. mix them together until completely dissolved!) and pour it into the pan. Mix well and cook until just thickened. 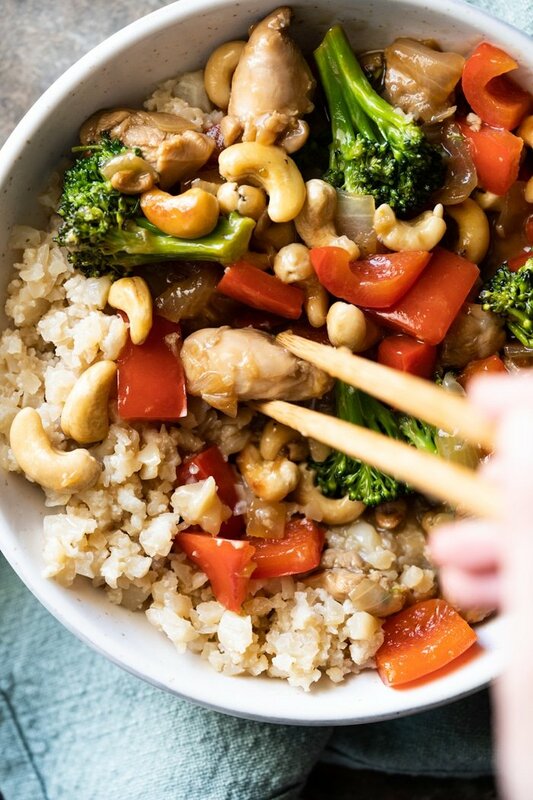 Stir in the cashews and serve right away over a bed of cauliflower rice (highly suggested!). 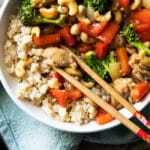 *While ginger isn't a traditional cashew chicken ingredient (though sometimes you will find it added! ), I find it livens up the dish a tonne! I like to add a full tablespoon of it, but feel free to do just 1 tsp for a lighter note. **Also note that cashews are a little higher in carbs than other more keto-friendly nuts and legumes (think 27g net carbs per 100g vs 7g net in peanuts). So just be sure to adjust the amount to fit your macros! ***While the thickener is in a way optional, it does make for an ultra silky (and rather beautiful!) sauce. You can use arrowroot (I do 2tsp, but you can do 3tsp for a thicker sauce) or glucommanan/konjac powder (1/4-1/2 teaspoon will do, as its potent stuff!). no coconut aminor, or arrowroot or Konjac in my country. Replacements?